Welcome to yet another binding discussion. Today, I will be schooling you on class bindings. 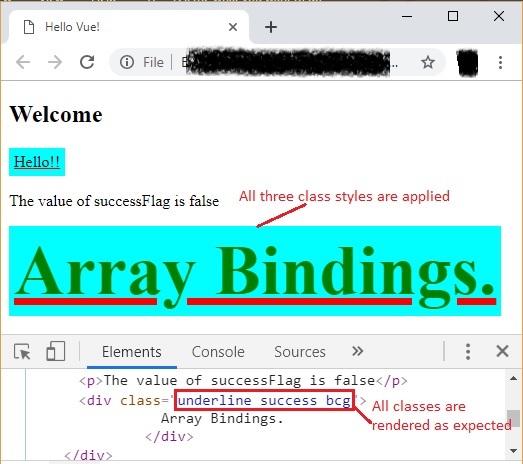 In other words, we will be playing around with HTML element’s class attribute by binding data to it using Vue. Why? Because we might be required to often manipulate the class list of an element. Just like any other data binding, we do the same song and dance here as well, i.e. the mighty “v-bind” or its shortcut “: “can be used to handle this scenario. Expressions can be evaluated to strings, objects or arrays. Sounds confusing? No worries! Let’s take one step at a time with the backing of some examples. You will see yourself sprinting in no time! With Vue, it is very easy to dynamically toggle this class by passing it as an object to v-bind:class. The shortcut : is used for the directive v-bind here. Very simple! We have a div tag which displays, “Hello!!”. 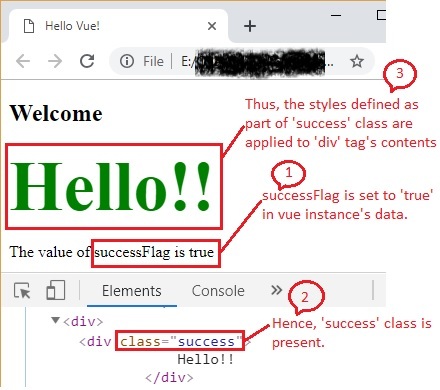 Since the data property, successFlag value is true, the class success is included in the div tag and its styles are applied to the text within the tag. The result can be clearly seen in the browser. Chrome DevTools pane shows how the ‘success’ class is present in the HTML code. 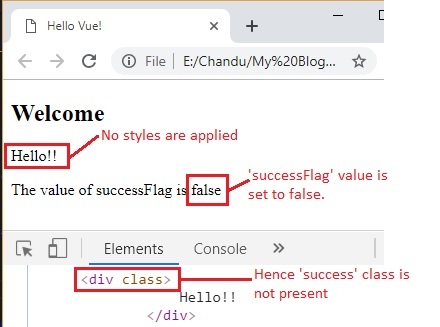 In case we set the value of successFlag to false, then this is how the output will look. WHAT IF we have the plain class attribute and on top of it, we would like to toggle the presence of another class with the help of v-bind:class? In other words, can we have class and v-bind:class at the same time on an element? Is it possible? YESSSS!! With Vue, almost everything is a yes! The best part is, we can achieve this in two ways. The plain class attribute has the class, underline which will always be rendered. It is also possible to have more fields in the object passed to v-bind:class. To understand this, let us toggle two classes based on the truthiness of its values. In the above code, two classes success and bcg are passed as an object to v-bind:class. successFlag and bcgFlag are set to false and true respectively. So, the class list that is rendered becomes, “underline bcg” and only those styles are applied. 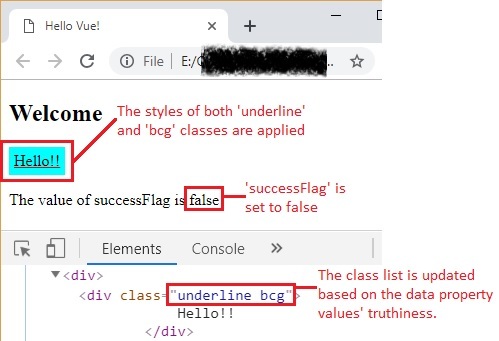 The object to be bound to v-bind:class is specified in vue instance’s data. For simplicity, I am using the same classes for this example too. Fire up your favorite IDE and code a few scenarios of your own! If you have any questions, feel free to shoot them in the comments section. Stay tuned as our next post is all about binding inline styles. Lakshmi Chandana is a Software professional + passion-fueled blogger + novel-reader + artist + tutor to make your day a little brighter than it was before! She is thrilled you are here! So, dive in to explore the fun-filled World of Learning! !